6:30 AM and getting ready. 10:00AM and things are rolling. A layer of "concrete mix"? is laid down. Then it is mulched into the roadbed ten inches deep with oil and water added? meanwhile, the locals try to get on with daily life. I really have no idea what the process is or what materials are being used but it sure is interesting! Okay, I Googled the process and found some explanation. 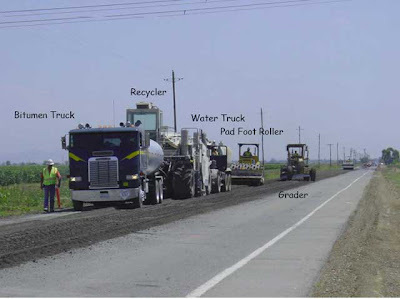 This AC Foam process is a way to recycle the original asphalt and use it again. Here is the equipment working on a highway. It is called a "train". "Recycling began in the westbound lane. The pavement was recycled together with foamed oil and cement. The pads foot roller would then make an initial pass to compact the uncompacted material between the wheels of the recycler and back drag to level out the material. The pad foot would then continue until the roller walked itself out of the material, approximately three coverages. Next, the grader would cut the material to rough profile and cross slope but leave it about 1” high. The steel drum roller would then make three coverages with the vibratory on. The grader would come back in and cut the material to desired profile by hanging the blade on the centerline of existing and setting the blade to the desired cross slope. One final coverage with the steel drum roller, with the vibratory off, to iron the finish. 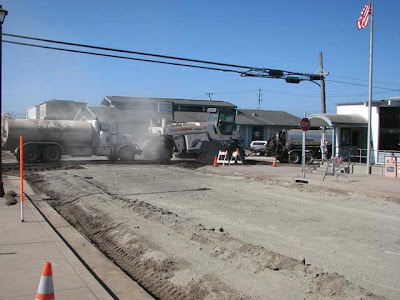 A water truck would then give a heavy spray of water as the pneumatic tired roller worked the water in to the recycled material, approximately three coverages. This would bring some fine material to the surface to give a smooth finish. 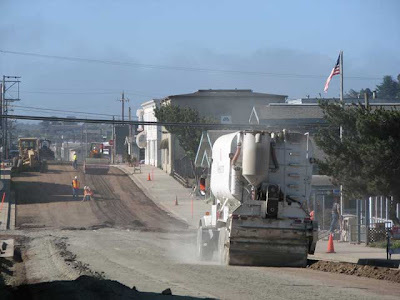 A final sweeping and the compacted, recycled material was ready for traffic. The recycled material needed to cure for a minimum of two days before placing the HMA overlay. The 45-mm HMA overlay of the westbound lane began at PM 20.0 when the recycling of the westbound lane at PM 10.3 was completed. The train then began recycling the eastbound lane at PM 10.3, heading eastbound. When the eastbound recycling was complete at PM 20.0, the HMA overlay of the eastbound lanes began at PM 10.3. 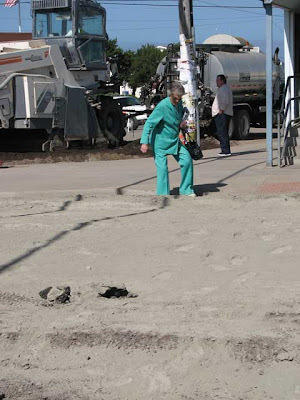 Sweeping to remove any loose material was required prior to releasing traffic on the recycled material. Each recycled segment was lightly watered three to four times a day for at least two days. 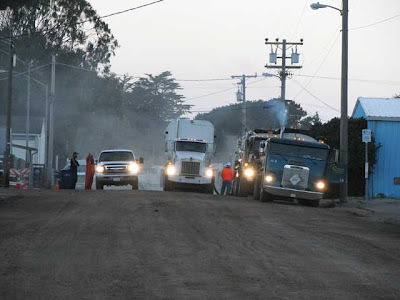 After the first night of traffic running on the recycled material, it was determined that sweeping the day after a segment was recycled would also be required. This resulted in no windshield breakage claims. Taken from this large PDF file. Great pix & info. Hope to see you this week. Excellent. Doddery would've been proud.